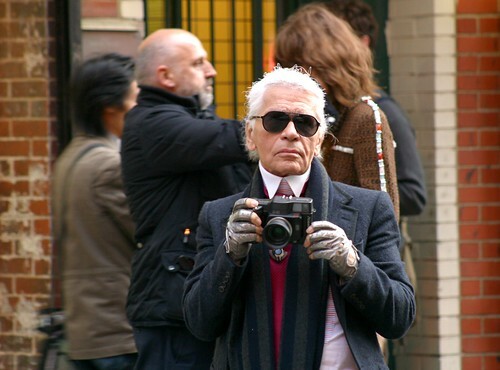 By The Greyest Ghost, who went down down to see Karl Lagerfeld despite her prior engagement. What cool pictures! These are some of the best online pictures I have seen around in a long time! The Chanel’s photoshoot for the Fall/Winter 2010 campagin looks a-friggin’-mazing! I can’t wait to see the final ads! I’m not the one who took this pics but yesss, what great pics! I think behind-the-scenes is a better inspiration than the ads, what do you think? ANYbody can see the ad, right? This post is direct rip of stockholmstreetstyle. You should CREDIT. Do not rip. Hi there, I think you’re mistaken. I saw this on The Greyest Ghost and I credited the blog on my first line. Hi. The photos Wonderwool is using are from my website, The Greyest Ghost. I’m confused as to why you’d think this is a rip off of Stockholm Street Style, considering it’s my original content. You’re welcome! Thanks for featuring my photos! No clue what the person from Stockholm Street Style is going on about. haha.